December, 2006--Ahh, I can just imagine heading there now. The amazing turquoise waters, the warm wind, the lush green hills. Did I say, AHHHH!?! The approach to the Hawaiian island of Kauai, breathtaking and awe inspiring. Paradise, how I pine for thee. Want to join me in A Thousand Words Thursday, read and grab my button from HERE. Then write in your name and blog addy in Mr. Linky below. 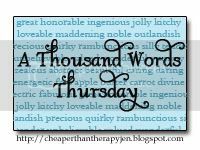 Please link only to "A Thousand Words Thursday" posts, and visit the other participants as well, thanks! Hawaii made me cry like a big sissy girl! I was all " Oh Lawrd, I don't deserve to see this, to be here... but thanks for bringing me man!" Man... I'm going there in my dreams right now! lol It's freezing here in Ohio! Wow...what a great pic. Even better that it was taken during a flite to paradise!! Happy ATWT to you, Jen! 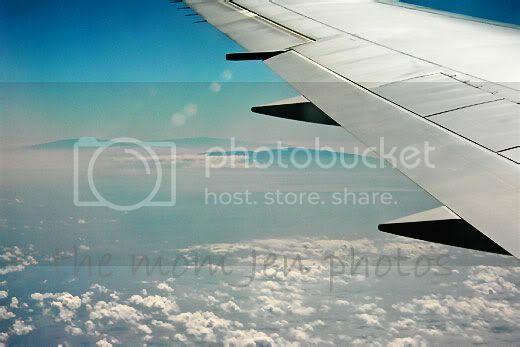 I would love to be on that plane right now! me too I long for a beach vacation! What a nice morning break. ahhh...reminds me of my honeymoon. different location but same feeling of paradise! That is such a beautiful picture. Deffinately worth 1,000 words. Wow! I love your photography. I need to get me a good camera and start getting into that more. I have always wanted to. What kind of camera do you use? Great photo. I have not yet visited Hawaii, would love to some day (on the way to the South Pacific!). Warm water and beaches sound good today where even in Orlando it was below freezing this morning! I so wish I had that view right this second. Beautiful. I love kauai. I told my husband I would be completely OK with a transfer there...should he ever work for a company with a presence in Hawaii. Oh man, that made me sigh out loud. What I would give to be there (as I sit in 8 degree weather)!!!!!! Your picture is so beautiful! I'm longing for a vacation too. I wanna go somewhere tooo!! I would love to go to Hawaii!!! You're a great photographer. Please, please take me with you! Dont think I am getting my Valentines wish...my husband asked what I wanted...I said another trip to Hawaii! It has just been so cold this winter...I would love to just sit on a nice warm beach. I love this picture! It is a view that I never see when I fly. Why? Because I HATE to fly and am always asleep the entire flight thanks to Dramamine!!! Beautiful photo! Thanks for giving us all a little escape, I sure wish I was about to land in Hawaii too. I have an aunt and uncle who travel the world, and have been to Hawaii several times. Meanwhile, my wife and I are here in the cold, along with our 22 month old toddler. Will spring get here already! OMG - I am SO jealous! I want to go to Hawaii SO BAD!! NO-I've never been! Can you believe it? Now would be the perfect time too...get away from all this cold!! Oh how I long to go there! Every time I fly I always try to get a seat behind the wing. Not only does it give me great vistas, but it also allows me to see how the wing works. Awesome photo and I am determined to get our family back to Kauai in '09. Heaven. Aaah - the Garden Island. I can smell the flora and fauna now. Almost makes airling travel worth it! what a great picture! I've always wanted to go to Hawaii!!! Oh man....I need that right now. Oh How I miss Hawaii especially Maui! Can't wait to plan a trip and take the kids there. I hope my hubby takes me to Hawaii someday! It's not Thursday, but I left a 1000 words anyway. Hope that doesn't get me kicked out of the blogosphere. I like your blog and have visited a few times.